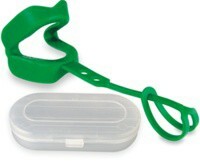 It’s time to be active in sports and you want a green mouth guard. We feel the Denta-Gard mouth guard should be high on your list for green mouth guards. There are many mouth guards on the market today. Many mouth guard companies claim their mouth guard is the best. After reading the information below, we are sure you will agree that the Denta-Gard is the best green mouth guard available and it has more oral protective features. There are many features that will distinguish the Denta-Gard from other green mouth guards. When choosing a mouth guard, an effective mouth guard is a key element and most would say it is a critical component of the selection process. Choosing the best green mouth guard can be confusing. With the following information, our goal is to clarify differences between mouth guards so you can make an informed choice on this important oral protective appliance. Worn over dental braces – The Denta-Gard does not counteract an orthodontist’s technically and precisely planned movement. Therefore, preserving corrections and adjustments your orthodontist has scheduled. Concussion reduction – This is an important, but controversial subject. There are no clinical trials to support the statement that a green mouth guard will protect against concussions. One theory is that a mouth guard should dissipate and/or absorb the force of an upward blow to the jaw. It should be approximately 4mm in thickness on the occlusal surface. Denta-Gard has these properties. In addition, cushioning between upper and lower teeth can be effective at reducing the incidence or severity of concussions. Denta-Gard provides that level of cushion protection. Protects both upper and lower teeth – Why wear a mouth guard that only protects half of your teeth? The unique design of the Denta-Gard protects both upper and lower teeth at the same time. Allows open mouth breathing – As a result of the natural spring hinge on the Denta-Gard green mouth guard allows open mouth breathing and understandable speech. Comfortable to wear – Soft and pliable, yet strong and tough. The Denta-Gard is comfortable to wear. Athletes tend to wear it more consistently than other green mouth guards. Virtually indestructible -Athletes tend to chew down the ends of commonly used hard plastic mouth guards, as a result, coaches and trainers are unable to determine if the guard is now offering protection. Denta-Gard is virtually impossible to chew through. Because of its comfort, most are not tempted to remove it intermittently and therefore do not even try to chew it. Latex and BPA free – The Denta-Gard mouthguard is latex and BPA Free. Made in the USA – Denta-Gard is made in the USA with FDA approved materials. We invite you to browse our website to learn about our green mouth guard and the Denta-Gard® Mouthguard. Be sure to watch our Denta-Gard product demonstration video on our home page.